want to get married… You’ve come to the right place. We want to get hitched! ‘To run away and to not come back to the point of origin’. I like to say that an elopement is an intimate, private and personal ceremonial experience. It usually involves you, your partner, me and two witnesses. ‘An abbreviated celebration of marriage that has only a handful of guests’. A micro wedding has all the intimacy of an elopement but with more guests invited to be apart of the celebration’. 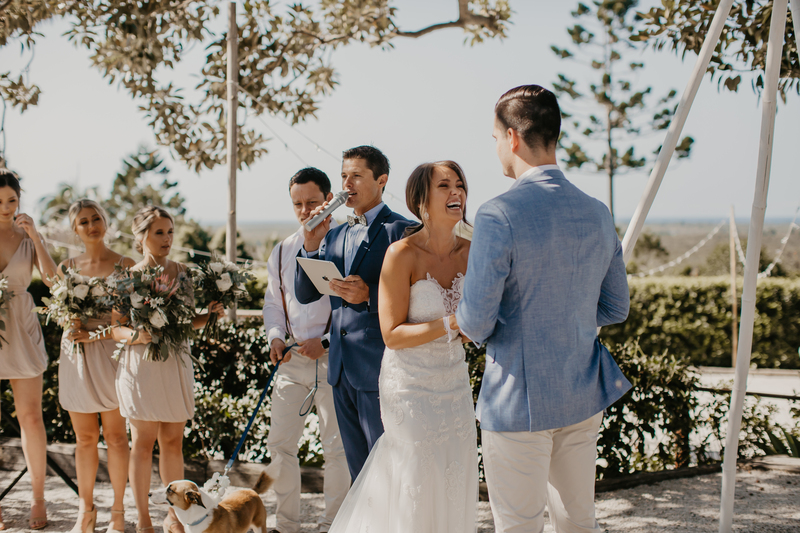 Micro-weddings usually have your closest family and friends involved and are commonly positioned at your favourite beach, park, backyard or restaurant. A wedding with all the personal touches of a miro-wedding, but with a reception to follow with all your best friends and family members. Your ‘Grand’ wedding usually involves a year of planning and preparation, and I like to think that your ceremony is the start of your awesome wedding experience. This Is your day, you deserve this. Live music sounds like a good time. It provides that all important ambience and really sets the tone for your ceremony. Live music is real, it has personality and a voice and gives you a memory which you wont forget. 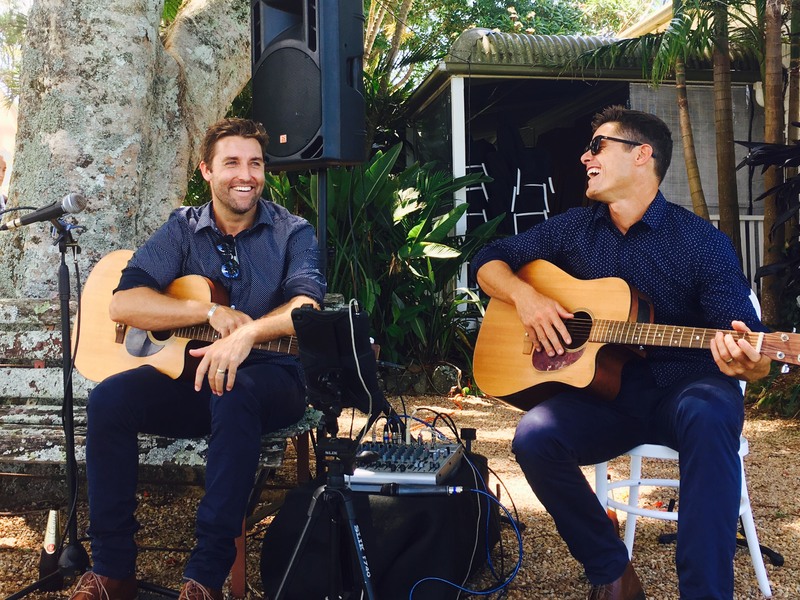 I often team up with my best mate and one of the industries best singer/songwriters Jake Newell to help soundtrack your wedding. I am a dad, husband, surfer, lover of the outdoors, sport and live music. Over the past 20 years, I have been a lifeguard, school teacher, traveler, pizza chef, and sales rep. I have a silly memory for ridiculous stuff, and I love learning new things about people and the world. If I am not at a wedding or playing music, I’ll probably be checking the surf, footy scores and seeing what my beloved dragons are up to. I have been in the wedding industry for about a decade now and I love the connectedness, unity, emotion, laughter, and tears that weddings bring out in people. From the first email to the last photo, I love the process and building of a fairytale ceremony and turning it into a reality. I get my energy, enthusiasm and drive from meeting new people, learning about them, hearing their story and finding out what makes them want to commit to each other FOREVER. OUR BEST DAY EVER....our day was more amazing than we could have ever imagined. A massive thank you to Andrew! The atmosphere was filled with love, warmth & fun, creating the vibe that flowed on throughout our special day. Our ceremony was personal & true to us, the inclusion of our guests was a beautiful touch. We loved Andrew & the experience he created for our once in a lifetime day. We couldn’t recommend Andrew more highly to give you, YOUR BEST DAY EVER! If there was a celebrant to rule them all, Andrew Michael Celebrant would be the chosen one!!!! There are many, many, many reasons why we loved having Andy as our celebrant, but here are our top 3! #1 Attention to detail - Andy took the time to get to know us and our story, he did his research in learning all the the little details so when it came to our big day, he recited our story to our friends and family like he was there watching it all unfold over the years. #2 His Delivery - Andy captured the tone of our relationship perfectly. He knew we were fun loving people who loved a laugh, and he made sure to include that same light-hearted witty humor when he wrote his speech about us to read to our friends and family during the ceremony - this really set the tone for the whole day. Whatever the tone of your relationship is, Andy makes sure he captures it perfectly to represent who you are as a couple. #3 - Super Duper Professional - Andy had all the T's crossed and I's dotted. He was very organised in all the 'behind the scenes' paperwork that needs to get done and is super knowledgeable with any special circumstances that may arise. My Hubby and I cannot recommend him enough for all the work he put into making our ceremony incredible intimate and unique, so much so we're adding in a #4! He's a bloody legend and we highly recommend his musical services as well. Our wedding day was amazing and it all started at the ceremony with Andrew making everyone feel at ease. He has a truly amazing gift, his ability to speak to family and friends, and to us as if he has known everyone for years was fantastic. Andrew took the time to get to know us and our family and the ceremony reflected us to a tee. We could not have hoped to have a better celebrant. If there was a rating 6 Andrew would get it. Thank you Andrew, you made our day. On your wedding day, you just want the bloke standing up there marrying you to make you as comfortable and relaxed as possible. Andrew did this with such class making our special day an absolute breeze. From our first meeting, he was determined to tailor his services around exactly the mood we were after, always doing so with a smile on his face. His love for celebrating weddings is infectious and everyone at our wedding loved the flavour he brought to the day. We are so thankful for Andrew's involvement on our day and we are proud to also call him our friend. If you're looking for a celebrant for the most importnat day of yoru life then look no further than Andrew. He was incredible in every way, the ceremony was fun, relaxed and without him the day would not have been the same. He calmed me down and talked me through the entire time ensuring I was cool, calm and collected. I still cried like a baby. Without Andrew as my celebrant it would not have been so perfect, thanks for everything. Thank you Andrew for our perfect ceremony. You went beyond for Harley and I. If I was feeling nevous leading up to the wedding you were only a phone call/message away. We are both thankful for everything you have done for us. You made our ceremony short but it was fun and celebrate our love. We love how you kept most of the ceremony a secret, it was perfect. You helped us in everyway. Thank you for being our celebrant, music and MC. Thank you for having a dance with me. It was lovely. Thank you. 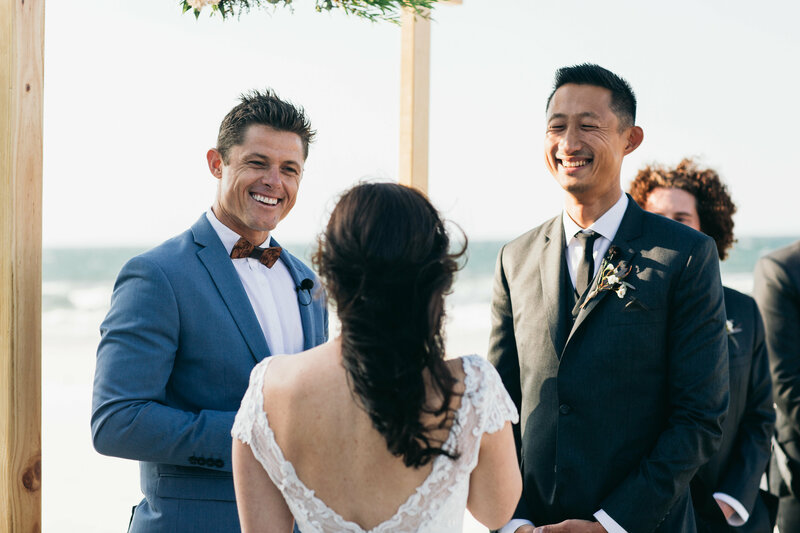 Andrew was the perfect marriage celebrant for us, we would like to say thank you again for the perfect ceremony what he did for us, the flexibility, the kindness, and the way that he handled our wedding. 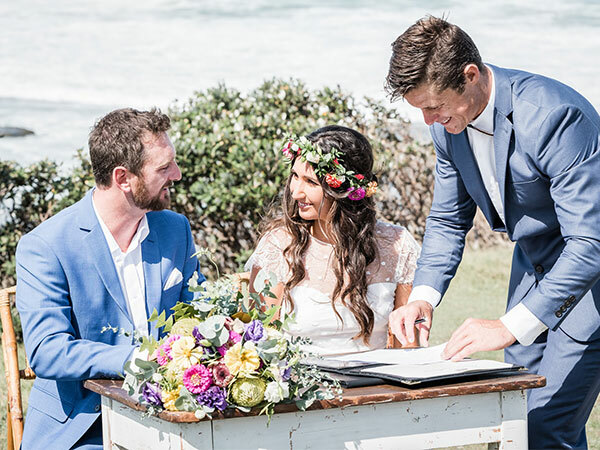 If you want a marriage celebrant, who really cares about YOU and who wants to make your most important day of your life more than perfect, Andrew is the best choice. My husband is a really nervous type, and he said that Andrew was so nice and friendly and he took care of everything that my husband forgot everything and he just felt more confident than ever. Andrew was exactly what my now wife 🙂 and I were looking for. He made the day fun, easy going and simple and did i mention fun :). He really helped us through every part of the planning process right up until the big day. Without him it would not have been the perfect day that it was. Thanks Andrew!! Words could never really express the immense gratitude we have for all that you did for us on Mon 26 Feb 2018! From our initial relaxed and fun meeting we knew you were our perfect match! Nothing was ever a hassle and everything went exactly as we had hoped! Working with a brilliant and easy going bloke like you was an absolute pleasure! And we hope other couples are as lucky as us to have you as part of their day! We loved our ceremony and the joy and charisma you brought to it! Thank you for allowing a little element of our family too! Thank you for making it all so easy and so us! The classic DJ tunes at Balter, the fun and the laughs just brought it all together – thank you for memories we will cherish for ever! We loved every aspect of both your role in our ceremony and then our reception! Thank you from the bottom of our hearts for making that all possible! So lovers get to contacting Andrew Michael to officiate your I Do - yewww!! !